So Alpina is still out there. I should actually say ALPINA (all caps), because that’s the way they spell it. I used to see ALPINA stroked 3 Series now and again, and then they more or less disappeared. I thought that ALPINA was gone, but no, they’re still out there. They’ve had a go at BMW’s top of the line 7 Series sedans, with impressive results. Even more impressive is the amount of coin you’re expected to shekel out for these things. A few weeks ago they teased with specs and a few shots, but now they’ve let out the full kit, including prices. Yes, it’s all very impressive, but the price is more than a little staggering. Things start at $122,875 and go up from there. Actually, let’s just get this out of the way, right away: $122,875 for the standard wheelbase and $126,775 for the extended wheelbase model. Yeah, I know. You could get a nice used Ferrari F430 for that. To each their own, huh? So what would you get for your $122,875 to $126,775? As you would expect, you get a lot of power. 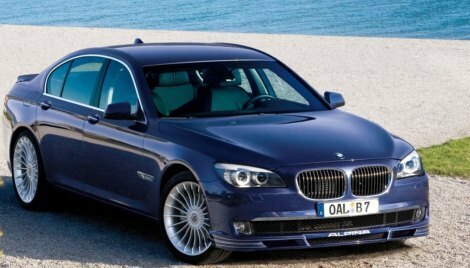 Either B7 sedan comes with BMW\’s twin-turbocharged 4.4 liter, all-aluminum, High Precision Direct Injection V-8 engine. Naturally ALPINA has given it a working over, so now it produces 500 horsepower and 516 lb-ft of torque. Yeah, that’s pretty damn impressive. That’s enough power and grunt to move the ALPINE tweaked lead sled from 0-60 mph in 4.5 sec. BMW also notes that the massive torque is available from 3,000 to 4,750 rpm, which means the B7 “accelerates effortlessly from virtually any speed.” I wouldn’t argue with them. 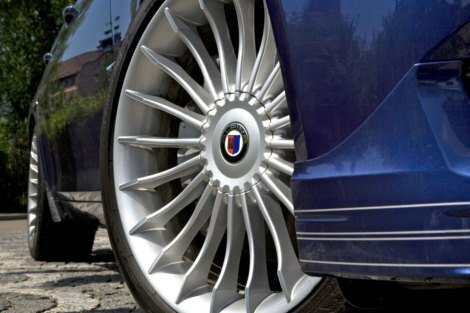 And you also get these really nice looking 20-spoke ALPINA Classic wheels. Interior-wise the B7 sedan has ALPINA blue illuminated door sill trims, a Switchtronic heated steering wheel in hand-stitched Lavalina leather (no, I don’t know what Lavalina leather is either, and with Ricardo Montalban no longer with us, I don’t know who to ask). There’s the requisite Alcantara headliner, a Heads Up display, and a Black-Panel LCD screen instrument cluster branded with ALPINA. Hand-stitched Lavalina leather also covers the dashboard, the door panels, the center console, the multi-contour front seats with heating and cooling, and the heated rear seats. Both models of the BMW ALPINA B7 will make their North American debut at the Chicago International Auto Show and will go on sale at authorized BMW Centers in the Spring of 2010. Pricing announced for special high-performance models. Woodcliff Lake, NJ – February 1, 2010- BMW announced the pricing today for the 2011 BMW ALPINA B7 sedan, which will join BMW\’s North American product range as the most dynamic 7 Series model. 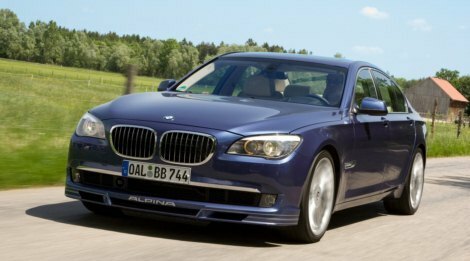 As the second generation of ALPINA automobiles based on the BMW 7 Series to be offered in the US, the 2011 BMW ALPINA B7 sedan will retail for $122,875 (standard wheelbase) and $126,775 (extended wheelbase). Both prices include $875 Destination & Handling. 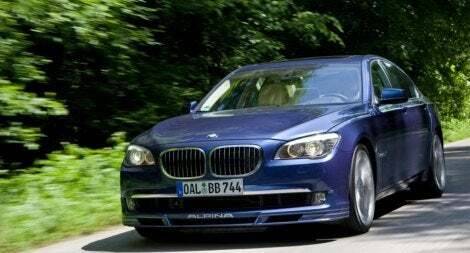 The first BMW ALPINA B7 was offered as a limited edition for the 2007 and 2008 model years. Newly interpreted and based on the current BMW 7 Series platform, the B7 will again set the benchmark in terms of performance, refinement, and technology. Yielding exquisite levels of power and torque from the twin-turbocharged 4.4 liter V8, and in conjunction with the electronically-adjustable suspension with Active Roll Stabilization, the new B7 promises to offer a spectrum of driving experiences so broad as to be unheard of in this class of automobiles. The evolution of the traditional 20-spoke 21″ ALPINA Classic wheels underlines the fresh design language found throughout the B7 and imparts to it a distinctive appearance and powerful stance. Both standard- and long-wheelbase models will be offered. The BMW ALPINA B7 will make its North American debut at the Chicago International Auto Show and will go on sale at authorized BMW Centers in Spring of 2010. The B7 sedan is equipped with BMW\’s twin-turbocharged 4.4 liter, all-aluminum, High Precision Direct Injection V-8 engine which has been enhanced by ALPINA and is capable of producing 500 (373kW) horsepower and 516 lb-ft (700Nm) of torque. This rear-wheel drive performance/luxury Sedan achieves 0-60 mph in 4.5 sec. With maximum torque available across an unusually broad engine range, from 3,000 to 4,750 rpm, the B7 accelerates effortlessly from virtually any speed. The B7 sedan is finished with ALPINA aerodynamic developments, including front and rear spoilers which not only enhance the appearance but also improve stability and performance at high speeds. In true \”form-follows-function\” fashion, the ALPINA front integrates the fresh-air requirements of the transmission and engine oil coolers, which are separated out of the main cooler module for improved efficiency. The spoilers reduce lift at the front by 30% and rear by15%. The exhaust system\’s two double tailpipes are seamlessly integrated into the rear bumper. The newest evolution of the traditional 20-spoke ALPINA Classic wheels gives the B7 a distinctive appearance and powerful stance. The interior of the B7 sedan features ALPINA blue illuminated door sill trims, Switchtronic heated steering wheel in hand-stitched Lavalina leather, Alcantara headliner, Heads Up display, and the Black-Panel LCD screen instrument cluster branded with ALPINA. Hand-stitched Lavalina leather also covers the dashboard, door panels, center console, multi-contour front seats with heating and cooling, and heated rear seats. The full complement of BMW 7 Series exterior colors remains available, in addition to the signature ALPINA Blue metallic paint. BMW of North America, LLC has been present in the United States since 1975. Rolls-Royce Motor Cars NA, LLC began distributing vehicles in 2003. The BMW Group in the United States has grown to include marketing, sales, and financial service organizations for the BMW brand of motor vehicles, including motorcycles, the MINI brand, and the Rolls-Royce brand of Motor Cars; DesignworksUSA, a strategic design consultancy in California; a technology office in Silicon Valley and various other operations throughout the country. BMW Manufacturing Co., LLC in South Carolina is part of BMW Group\’s global manufacturing network and is the exclusive manufacturing plant for all X5 Sports Activity Vehicles and X6 Sports Activity Coupes. The BMW Group sales organization is represented in the U.S. through networks of 338 BMW passenger car centers, 335 BMW Sports Activity Vehicle centers, 142 BMW motorcycle retailers, 90 MINI passenger car dealers, and 31 Rolls-Royce Motor Car dealers. BMW (US) Holding Corp., the BMW Group\’s sales headquarters for North America, is located in Woodcliff Lake, New Jersey. 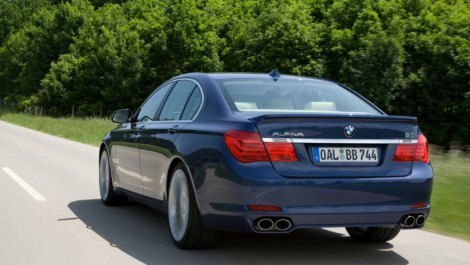 No Comments on "The New BMW ALPINA B7 Sedan – Get out Your Checkbook"